xACT 2.47 - Audio compression toolkit. 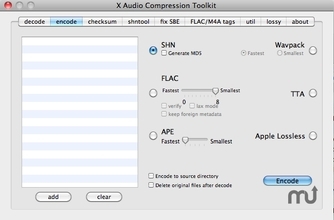 xACT stands for X Audio Compression Toolkit, an application that encodes and decodes FLAC, SHN, Monkey's Audio, TTA, Wavpack, and Apple Lossless files. It also can encode these formats to MP3, AAC, or Opus, and do various other utility functions, in addition to a full set of shntool functions. Under the hood, xACT is a GUI based front end for the unix applications Shorten (3.6.1), shntool (3.0.10), Monkey's Audio Compressor (3.99), flac (1.3.1), wavpack (4.70.0), TTA (3.4.1), Opus 0.1.6, and cdda2wav 3.0 (with paranoia support). It also uses SoX ( 14.4.2), LAME (3.99.5), AtomicParsley (0.9.0), TagLib (1.9.1) and MP4v2 (2.0.0). It executes the basic commands of these applications and adds other features to speed up productivity in creation/use of etree.org standard filesets.